α-Ketoglutaric acid (2-oxoglutaric acid) is one of two ketone derivatives of glutaric acid. (The term "ketoglutaric acid," when not further qualified, almost always refers to the alpha variant. β-Ketoglutaric acid varies only by the position of the ketone functional group, and is much less common. Its anion, α-ketoglutarate (α-KG, also called 2-oxoglutarate, or 2OG) is an important biological compound. It is the keto acid produced by deamination of glutamate, and is an intermediate in the Krebs cycle. The alanine transaminase (ALT) enzyme converts α-Ketoglutarate and L-alanine to L-glutamate and pyruvate, respectively, as a reversible process. α-Ketoglutarate is a key intermediate in the Krebs cycle, coming after isocitrate and before succinyl CoA. Anaplerotic reactions can replenish the cycle at this juncture by synthesizing α-ketoglutarate from transamination of glutamate, or through action of glutamate dehydrogenase on glutamate. Glutamine is synthesized from glutamate by glutamine synthetase, which utilizes an ATP to form glutamyl phosphate; this intermediate is attacked by ammonia as a nucleophile giving glutamine and inorganic phosphate. Proline, Arginine, and Lysine(in limited organisms) are other amino acids synthesized as well. These three amino acids derive from glutamate with the addition of further steps or with the use of enzymes to facilitate reactions. α-Ketoglutarate is transaminated, along with glutamine, to form the excitatory neurotransmitter glutamate. Glutamate can then be decarboxylated (requiring vitamin B6) into the inhibitory neurotransmitter GABA. It plays a role in detoxification of ammonia in brain. Acting as a co-substrate for α-ketoglutarate-dependent hydroxylase, it also plays important function in oxidation reactions involving molecular oxygen. Molecular oxygen (O2) directly oxidizes many compounds to produce useful products in an organism, such as antibiotics, etc., in reactions catalyzed by oxygenases. In many oxygenases, α-ketoglutarate helps the reaction by being oxidized together with the main substrate. In fact, one of the α-ketoglutarate-dependent oxygenases is an O2 sensor, informing the organism the oxygen level in its environment. In combination with molecular oxygen, alpha-ketoglutarate is one of the requirements for the hydroxylation of proline to hydroxyproline in the production of Type 1 Collagen. α-Ketoglutarate, which is known to be released by several cell types, decreased the levels of hydrogen peroxide, and the α-ketoglutarate was depleted and converted to succinate in cell culture media. A recent study has shown that α-ketoglutarate promotes TH1 differentiation and depletion of glutamine (by depleting its metabolite, α-ketoglutarate favors treg (regulatory T-cell) differentiation. It might play a role in skewing the balance in favor of tregs in the setting of the amino acid deprivation that can be seen in the tumor microenvironment. From Galacturonic acid by the organism agrobacterium tumefaciens. ^ Merck Index, 13th Edition, 5320. ^ Ledwidge, Richard; Blanchard, John S. (1999). "The Dual Biosynthetic Capability ofN-Acetylornithine Aminotransferase in Arginine and Lysine Biosynthesis†". Biochemistry. 38 (10): 3019–3024. doi:10.1021/bi982574a. PMID 10074354. ^ "Does infectious fever relieve autistic behavior by releasing glutamine from skeletal muscles as provisional fuel?". Archived from the original on 2014-05-19. Retrieved 2014-05-19. ^ Ott, P; Clemmesen, O; Larsen, FS (Jul 2005). "Cerebral metabolic disturbances in the brain during acute liver failure: from hyperammonemia to energy failure and proteolysis". Neurochemistry International. 47 (1–2): 13–8. doi:10.1016/j.neuint.2005.04.002. PMID 15921824. ^ Hares, P; James, IM; Pearson, RM (May–Jun 1978). "Effect of ornithine alpha ketoglutarate (OAKG) on the response of brain metabolism to hypoxia in the dog" (PDF). Stroke: A Journal of Cerebral Circulation. 9 (3): 222–4. doi:10.1161/01.STR.9.3.222. PMID 644619. ^ Long, L; Halliwell, B (2011). "Artefacts in cell culture: α-Ketoglutarate can scavenge hydrogen peroxide generated by ascorbate and epigallocatechin gallate in cell culture media". Biochemical and Biophysical Research Communications. 406 (1): 20–24. doi:10.1016/j.bbrc.2011.01.091. PMID 21281600. ^ Chin, RM; Fu, X; Pai, MY; Vergnes, L; Hwang, H; Deng, G; Diep, S; Lomenick, B; Meli, VS; Monsalve, GC; Hu, E; Whelan, SA; Wang, JX; Jung, G; Solis, GM; Fazlollahi, F; Kaweeteerawat, C; Quach, A; Nili, M; Krall, AS; Godwin, HA; Chang, HR; Faull, KF; Guo, F; Jiang, M; Trauger, SA; Saghatelian, A; Braas, D; Christofk, HR; Clarke, CF; Teitell, MA; Petrascheck, M; Reue, K; Jung, ME; Frand, AR; Huang, J (2014). 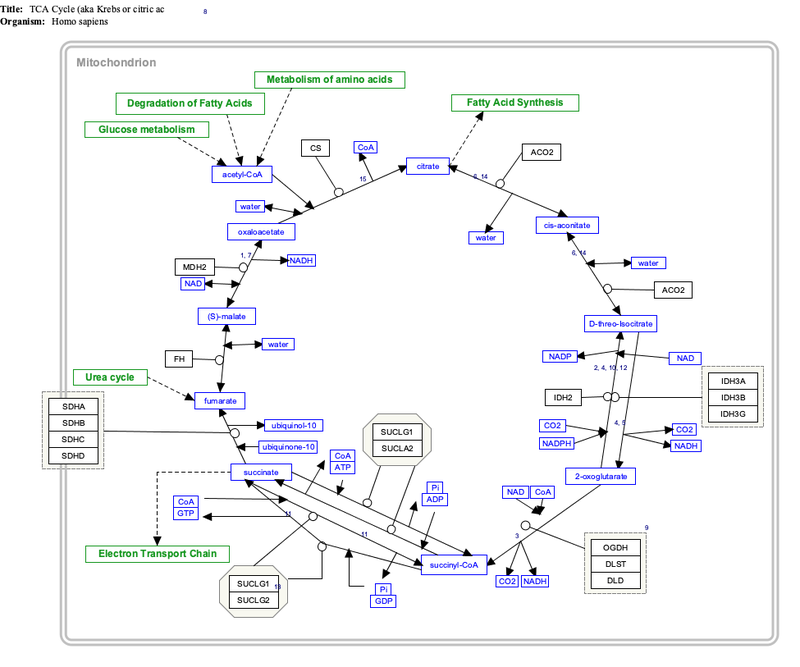 "The metabolite α-ketoglutarate extends lifespan by inhibiting ATP synthase and TOR". Nature. 510 (7505): 397–401. doi:10.1038/nature13264. PMC 4263271. PMID 24828042. ^ Klysz, Dorota; Tai, Xuguang (29 Sep 2015). "Glutamine-dependent α-ketoglutarate production regulates the balance between T helper 1 cell and regulatory T cell generation". Science Signaling. 8 (396): ra97. doi:10.1126/scisignal.aab2610. PMID 26420908. Retrieved 14 October 2015. ^ Richard, Peter; Hilditch, Satu (2009). "d-Galacturonic acid catabolism in microorganisms and its biotechnological relevance". Applied Microbiology and Biotechnology. 82 (4): 597–604. doi:10.1007/s00253-009-1870-6. ISSN 0175-7598. PMID 19159926.